Late evening visit until midnight close. Evening visit until midnight close. Interesting chat with another customer who had been drinking around in Glasgow in the very early days of CAMRA in the 70s. Evening visit until midnight close after a Tesco shop. Late evening bus change visit until midnight close. Late evening visit straight off the DLR, until midnight close. After midnight entry refused due to new policy of no admissions after 11pm on Friday and Saturday evenings. If only its website and opening hours signs were in any sort of accord!! 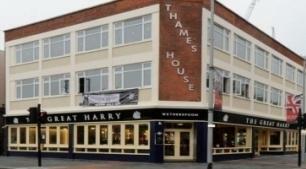 The pub is found in Woolwich, Greater London, SE18 6PQ. Large, corner plot Wetherspoon's. Stone's throw from Woolwich Arsenal Bus/Mainline Railway/DLR terminus by walking across the paved and grassed General Gordon Square. Woolwich first came to prominence in the early 16th century, when King Henry VIII established a dockyard here to build the Great Harry, the flagship of his new navy. This yard, where many famous ships were built, including the Sovereign of the Seas (in 1637), saw many royal visits and departures of voyages of exploration. Seriously damaged by fire in the early August 2011 riots and closed for the rest of the year and into 2012. A race was on to renovate and re-open by time of the 2012 Olympics as Woolwich was a venue for shooting events. The deadline was met and a new look and brighter and more shiny Great Harry arose. 10 handpumps, in 2 banks each of 5, adorn the bar counter which extends across almost all the width of the pub. We have visited this pub 52 times, seen 119 different beers and tried 52 of them.